The overall objective of the NGO Fund in Romania is “Strengthening civil society development and increasing contribution to social justice, democracy and sustainable development” and will contribute to the overall objectives of the grant of the European Economic Area (EEA) and Norway from 2009 to 2014, to reduce economic disparities and social in the European Economic Area and to strengthen bilateral relations between Romania and donor countries – Iceland, Liechtenstein and Norway. NGO Fund Operator in Romania is the Civil Society Development Foundation, together with its partners, the Foundation for Partnership and Resource Centre for Roma Communities. Supporting civil society are among the key priorities of grants European Economic Area (EEA) and Norway from 2009 to 2014, funded by Iceland, Liechtenstein and Norway, as mentioned in the Memorandum of Understanding on the implementation of this financing mechanism. The program will contribute to better governance in Romania by encouraging active participation of citizens through increased and effective involvement of NGO’s in the debate on public policies and specific measures such as targeting corruption and rule of law. More than a third of the amount allocated for grants funding covers key areas of democracy, human rights, transparency and good governance, participatory democracy, combating racism and xenophobia, anti-discrimination, social inequality, poverty and exclusion (including rural areas),gender equality, gender-based violence. In accordance with the Memorandum of Understanding for Romania, the program will address the specific needs of minority groups, especially the Roma population, combating social exclusion and promoting community involvement that generates solutions to community problems. More than 20% of this program is dedicated to providing basic social services to vulnerable groups, and a significant financial allocation is also provided for environmental protection and climate change. Over 10% of funds are allocated to projects for children and youth. A separate financial allocation is for activities that combat hateful speech, an area that is of particular interest for the program. In the Program are encouraged bilateral relations with donor countries in order to facilitate networking and collaboration with entities donor countries, access to knowledge and exchange of experience. - Component 5: NGO’s Capacity Development. Networks and coalitions. In the context of this component, the social justice means a set of measures to ensure inclusion of all persons equal access to resources, goods and services. Equally, social justice promotes the growth of skills and stimulate people to participate actively in economic , social and cultural life. This Call Applications is addressed to particularly vulnerable groups who have limited incomes insufficient to cover their daily needs due to lack of employment, poor health, limited access to social security, health, age submitted, etc. In 2012, according to Eurostat European Institute of Statistics, Romania occupies the second place among the most vulnerable countries in the European Union regarding the number of people at risk of poverty or people living in extreme poverty. Inequalities encountered mainly due to economic constraints, such as lack of jobs or low income obtained through work. To meet these challenges need attention to increase access to education for children and youth. But poverty is transmitted from one generation to another, education is not sufficient prerequisite to overcome the needs of poor families. The overall objective of social justice component is to help combat social exclusion and reducing disparities within society and between different groups of society. Component aimed in particular actions that demonstrate measurable results in the fight against poverty and social inequalities. The specific objective of the subcomponent 2.1. Development of rural ethnic communities is to help medium and long term development of disadvantaged ethnic communities and improve the situation of Roma population. UNITED EUROPE ASSOCIATION in partnership with commune Corbasca has proposed that in period May 2014 – April 2016 to train a total of 50 children and young people in learning instrumental techniques and with other experienced musicians from the community to revive the tradition of “Băcioiu’s Fanfare”. Musicians, the best known and most admired traditional Roma items since ancient times brought its practitioners revenue. In the past, every Roma family in the village Băcioiu had at least one child learning to play a musical instrument. Today this tradition which represent the main source of income was lost in Roma families there are increasingly fewer practitioners of it, something that leads to loss of identity. Also refoundation of the “Băcioiu’s Fanfare” will provide the glue between the two existing ethnic community and collaboration more efficient. 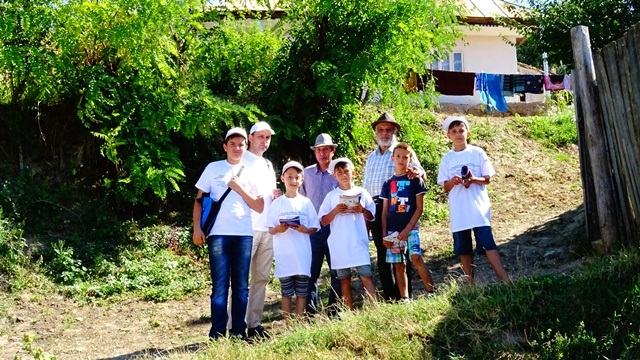 Roma revival of cultural traditions through specific activities in the development of interethnic relations and the social and economic situation of the Roma population in the commune Corbasca, Bacau. 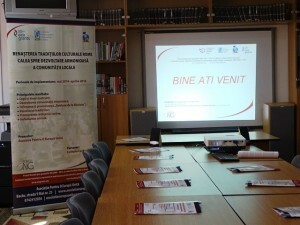 Ensuring promoting of “Băcioiu’s Fanfare”on internet and media. Target group: children and young of Roma origin. Direct Beneficiaries: 50 children and young and at less 108 adults of Roma ethnicity and Romanian. Indirect beneficiaries: the entire community. Project needs of direct beneficiaries of the commune Corbasca, Bacau, supporting children and young people who want to know the secrets of music. 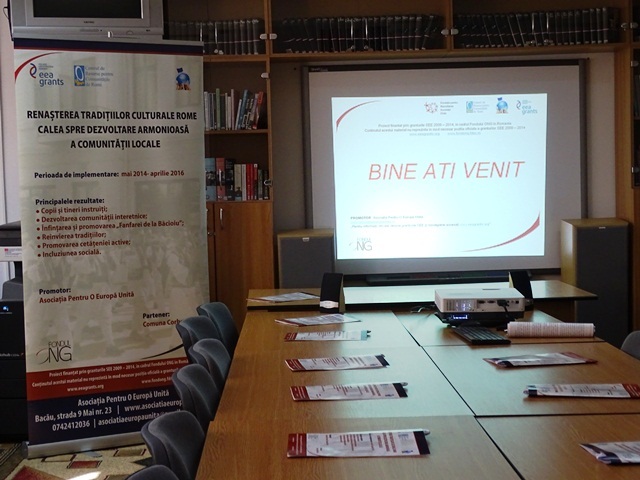 Wednesday, 08/13/2014, was launched the project “Renaissance Roma cultural traditions – the path to the harmonious development of the local community”, funded under the EEA Financial Mechanism 2009-2014 through the NGO Fund in Romania being in the thematic areas component 2 Social Justice, Subcomponent 2.1 Development of rural ethnic communities. United Europe Association in partnership with the City Council Corbasca has proposed that in the period May 2014 – April 2016 to train a total of 50 children and young people in learning instrumental techniques and with other experienced musicians from the community to re-establish “Băcioiu’s Fanfare “. The objective of this project is to revive cultural traditions of the Roma through specific activities in the development of interethnic relations and the social and economic situation of the Roma population from commune Corbasca , Bacau. The project launch was attended by members of the management team, mayor of Corbasca, Ciubotaru Vasilică along with vice-mayor, Puşcaşu Nicuşor and local media representatives. The “Renaissance cultural traditions rome- way to the harmonious development of the local community” was launched at Corbasca, Sunday, August 31, 2014. Is a project financed by the EEA Grants, 2009-2014, in the NGO Fund in Romania. The project is implemented in the North-East, starting in May 2014 (to April 2016), by the United Europe Association in partnership with Commune Corbasca. This project wants to revive the tradition of “Băcioiu’s Fanfare”. This will be achieved by training a total of 50 children and young people learning instrumental techniques and with other experienced musicians from the community to achieve our goal. Gypsy music is performed by the Roma musicians who are the majority, but also Romanian musicians. The term comes from the lute musician and perpetuated from generation to generation as a family profession. As our partners say: “We have talent, we have children, we have instruments, just the initiative was missing and now thanks to the United Europe Association there is and this initiative will produce a band,” said the Vice-mayor of Corbasca, Puşcaşu Nicuşor. Project launch of the “Renaissance Roma cultural traditions way to the harmonious development of the local community”, Contract no. RO2013_C2.1_03, total eligible cost estimated of the project is 73.200 euros. United Europe Association in partnership with Commune Corbasca is implementing the project “Renaissance Roma cultural traditions way to the harmonious development of the local community” in May 2014 to April 2015. The project will run for 24 months and receive funding under the EEA Financial Mechanism 2009-2014 through the NGO Fund in Romania fits into two thematic areas of Social Justice Component, Subcomponent 2.1 Development of rural communities by ensuring the participation of ethnic assets of both ethnicities because they want reestablishment community symbol “Băcioiu’s Fanfare”. General objective: Roma revival of cultural traditions through specific activities in the development of interethnic relations and the social and economic situation of the Roma population from the commune Corbasca , Bacau. • Ensuring the promotion of the “Băcioiu’s Fanfare” on internet and media. The target group: children and young of Roma origin. Direct Beneficiaries: 50 children and young and at less 108 adults of Roma and Romanian ethnicity. Indirect beneficiaries: the entire community. The project launch conference will be attended by members of the Association and a partner’s representative . During the conference we aim to promote the objectives, targets and indicators of the project.